No. You earn 10% when crediting to TAP Victoria only. Other programs it is based on fare class, however TP changes the fare class based on the family but there is no information regarding how it is changed. Many programs do not have a TP fare class that earns 10%. What do I earn in those programs? You're correct. I was wrong. I guess you'll never book TAP flights again because if this issue, or? This situation is somewhat similar to booking a star alliance codeshare flight and then getting the miles based on the fare class used by the airline operating the flight instead of the fare class shown for the codeshare flight number when you made the booking. Has that happened to you? When you book a codeshare the operating carrier can tell you the underlying fare class and (at least in the US) you hace 24 hrs to cancel if you guessed the underlying fare class wrong, this is not the case here. I still find it weird. If TAP sends a different fare-code for mile crediting purposes (than actually flown), then that breaks the 'contract' between airlines and FFPs. In fact, I would suspect that if you show your full booking, every single FFP would adjust the milage earning to the level as per the flown fare code. They will have to, because that is what they have defined on their earnings page. Actually, yes, this is stopping me booking TAP flights. And since I am currently based around FAO, that is costing them. For a very long time the tickets I booked in the "Discount" family with a booking code listed in the Miles&Bonus chart would earn me miles, usually 50%. Now I get nothing. I consider this deception by TAP that Aegean will not even attempt to challenge. So, I avoid them. I would have expected this kind of approach from Lufthansa group but not TAP. TAP said if you are concerned about booking class then call us to make a booking. That was their response on twitter. In February, I booked ARN-MUC-LIS, LIS-ZRH-ARN via Lufthansa. The LH6970 MUC-LIS leg operated by TAP was in Economy (V). This resulted in 1300 SAS EuroBonus points!! In May, I booked TAP flights ARN-LIS-OPO via Expedia and got Economy (E), which was denied by SAS ("Your ticket with Tap Portugal was booked in E class and tickets issued in this booking class do not qualify for EuroBonus points.") Oddly, the boarding pass says Class Y.
Oddly, the boarding pass says Class Y. *All* TAP economy class boarding passes indicate economy class by using "Y". (Similarly, all Lufthansa economy class boarding passes indicate economy class by using "M". 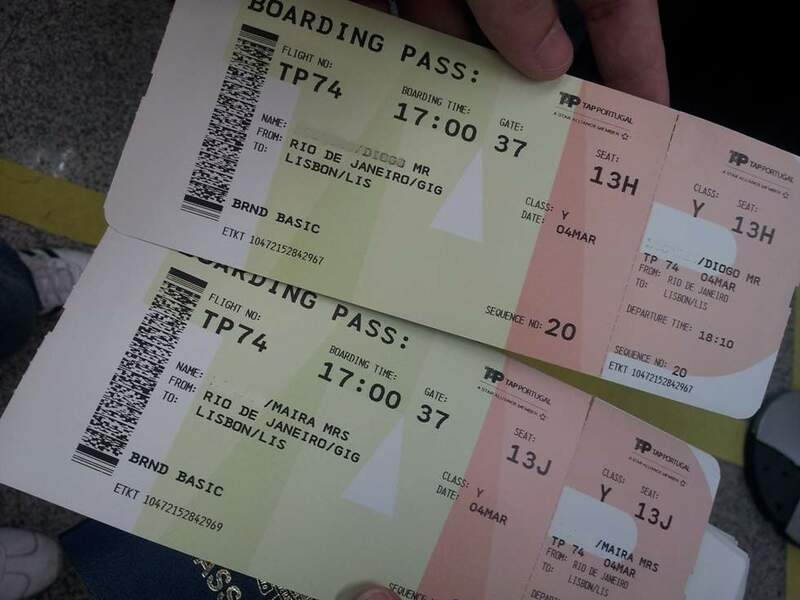 Many other airlies adopt a similar policy, using either Y or M on economy class boarding passes, merely to indicate the class of travel, not the fareclass of the ticket). It does not refer to the fare class of the ticket - but rather the cabin class that the bearer is travelling in. It is so that employees can recognise at a glance which cabin you are supposed to be in - which is all such employees need to know. If you travel in business class on TAP, your boarding pass is instead marked "C". In this case it means Cabin = Y. *All* TAP economy class boarding passes indicate economy class by using "Y". I would remove your images. the barcodes contain a lot of sensitive info. Those images are providing a lot of details. Hello!!! They are not my images. The people who posted them to their various online blogs are apparently only too happy to share such information, and to allow such information to be retrieved by Google Image Searches. Earlier this week I did a short MUC-LIS rt booked in T15BSC0B which was duly booked in T. To my surprise it showed up in my LH M&M account coded as W earning 500miles for each leg. Go figure. I book a "Classic" fare on Expedia that was on E, but it mapped to S on A3's program, earning 50%. It seems that TP has changed its booking class hierarchy, S fares are positioned between B and H fares, however most programs seems to bundle Y B M H Q as "full fare" earning 100% miles, considering S as a discount fare. I don't think it is done on purpose but it impacts negatively those purchasing a classic fare. My basic O fare was changed to A when accrued on A3 as I posted in a different thread. Now let's see if someone is ready to buy a flex fare on TP and credit it to A3. Is the system still a bit of roll of the dice, have things gotten more predictable since? I have been looking at LHR-LAD flights. From what I can see on Expedia, the code generally follow the price of the ticket. The price of the ticket is generally highest on Sunday (Q on Expedia), high on Monday (W on Expedia) then pretty low during the week-days (E on Expedia) for tickets that matches TAP AP's DSC ticket price. I was able to confirm with CS that all economy class tickets on a certain week-day that I picked are E. On one hand, it might seem questionable for DSC and Plus to have the same code. On the other hand, the price difference between DSC and Plus isn't that big compared to other airlines equivalent (DSC vs Flex). Additionally, Plus on a Tuesday is still very significantly cheaper than DSC on a Sunday. So overall it seems quite sensible to me for other airlines to just use the fare code. But what do I know.. Hence I would like ask if any more trend has been observed since the thread was made.